I'm doing a series on creative people's desks, and I thought I'd include mine. 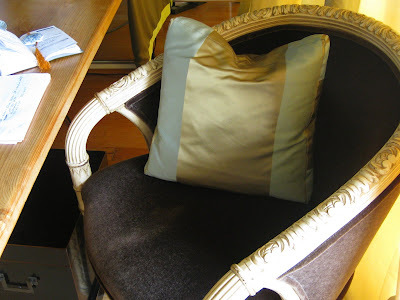 When you have almost no space to work with, creating a small office is a challenge. My apartment is 835 square feet, and my desk area occupies 7' x 5' of that. 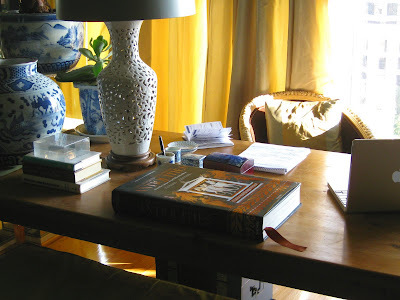 A rustic, 150-year-old pine table from Sweden serves nicely as a work surface, with plenty of room for my blue and white planters, some books, my tiny 12 inch PowerBook, and when I'm actually working, tons of papers everywhere. 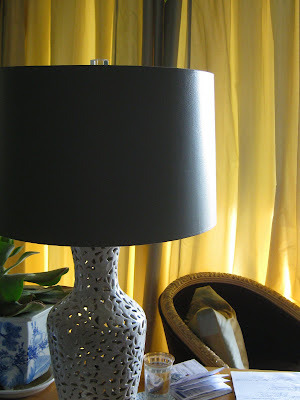 A good friend, Dallas designer Myrl Talkington, helped me set it up from things I already had on hand. 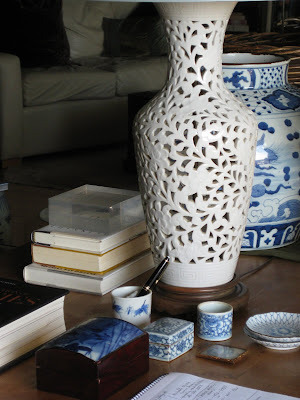 My collection of favorite, small oriental blue and white pieces turned out to be really functional -- and pretty -- for an office that's in full view when you walk in the door. 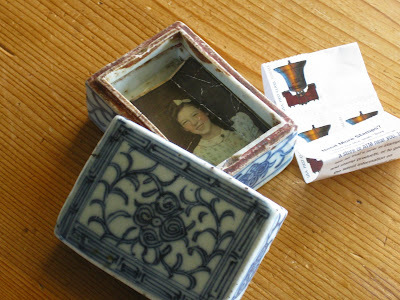 I keep stamps (and a hand colored photo of my mom at age 8) inside a late 18th century Chinese ink box. I bought this many years ago on eBay, when you could still buy authentic Chinese wares. 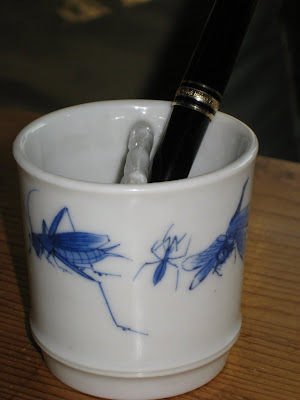 This 1920s era brush pot handmade by a studio artist in Japan, with its wonderful insects, makes a perfect container for pens. 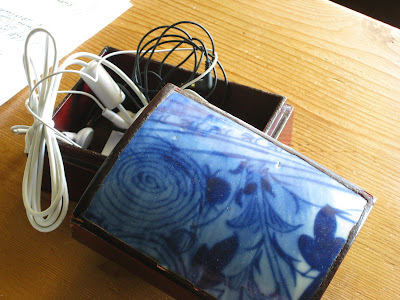 This box made from an antique Japanese roof tile corrals cords for my camera, tape recorder, and iPod, and that ugly bright yellow Hi-Liter I can't live without. (Does anyone know where I can buy a chic looking hi-lighter?) 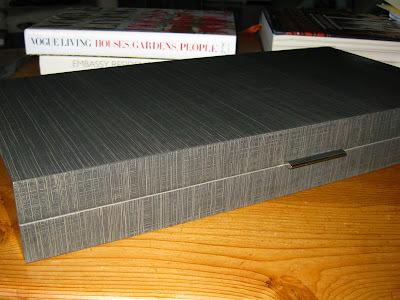 I bought the box years ago at the Mews, from Michelle Nussbaumer's booth. 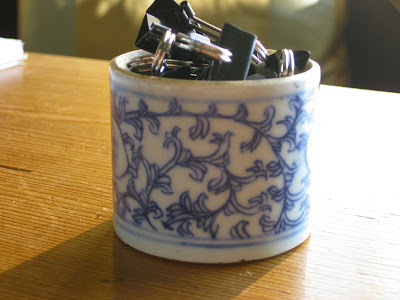 This tiny, 19th century Chinese brush pot holds just enough paper clips. 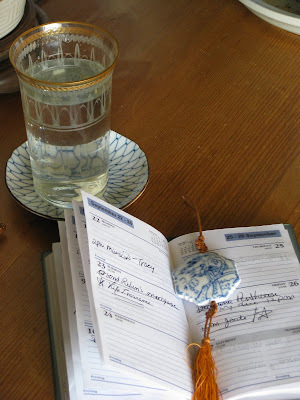 An antique porcelain and silk tassel bought on eBay is put into service as a book mark for my pocket calendar, which doesn't like to stay open. 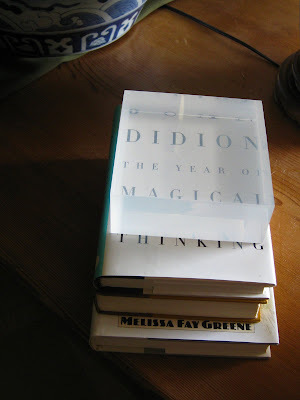 Speaking of bookmarks, don't you love how this chunky vintage Lucite bookend magnifies the title of the book? I found this vintage, carved chair from the White Elephant several years ago, and had it upholstered in Koplavitch & Zimmer chocolate mohair. 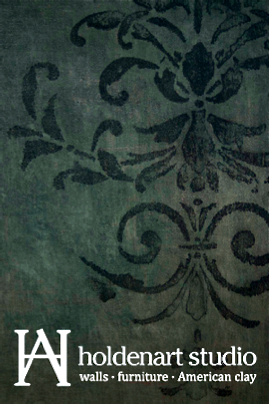 The pillow is done in Koplovitch and Zimmer silk, which I've found to be bullet proof and impossible to mess up. 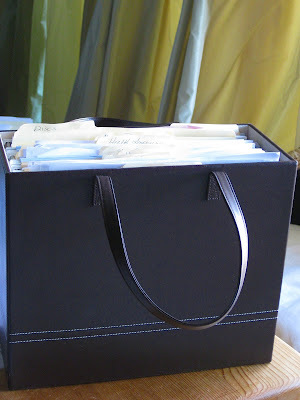 which looks nice at desk-side and holds file folders properly, full time. I can carry it off to the closet if needed. I just bought this Hewlitt Packard F4280 All in One printer, scanner, copier and fax machine. See how compact it is? 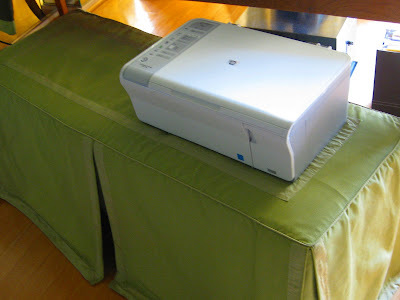 I store it under this skirted bench on the other side of my desk. It's a whole workroom full of machines in a 18 x 11 container! 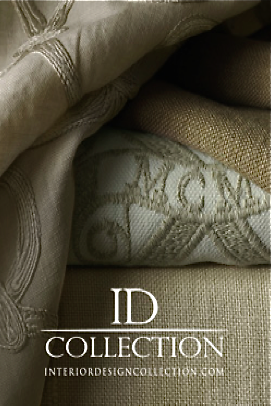 These just hit the market -- Martha Stewart, who was touting their space-saving, green qualities on her show recently, gave them away to all her audience members. Bill Clinton was her guest, and I think he got one, too. Naturally, I wanted one. Martha said you can mail back your ink cartridges to HP for recycling. I haven't done that yet, as there are no instructions on how to do that in the manual. In six months, you'll be able to buy refurbished ink cartridges online for them at a fraction of the cost, I'm told, and that makes it even better. 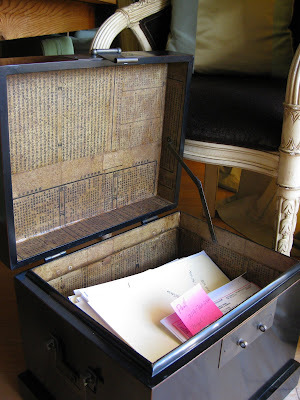 I keep my bills in this wonderful box by Barbara Barry. I call it the traveling desk because I can carry it around anywhere in the apartment and use it as a surface for writing. 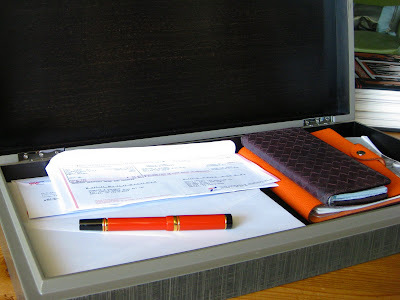 It's 20 inches long by 10 inches wide, so everything I need fits inside -- bills, envelopes, checkbook, calculator, etc. Got to get to work now!